It is so rewarding to go into your very own hen house and collect your delightful eggs. Even if you only have a small back yard you will still be able to house a couple of chickens and you need not pay the earth to set up your back yard flock. It is easy and fun to keep chickens on a budget. Many large egg producers only use hens for one year as their egg production falls a little after the first year. Sadly this leads to hens being disposed of when they have had very little chance at life. These chickens are often sold off once or twice a year very cheaply compared with the price for point of lay chickens. You will need to ask around to source these chickens but it is so very rewarding to give them a happy contented life. It is particularly rewarding to enhance the life of ex-battery hens. 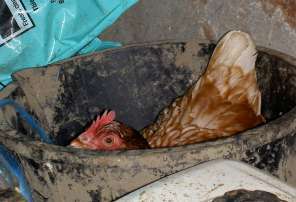 If you do not know of any local establishment you can contact the Battery Hen Welfare Trust. So you are not only extending the life of such unfortunate chickens but you are saving money too! Ex-battery hens will lay many eggs for you if you look after them correctly. Feed good quality food and ensure you always have plenty of fresh water available for them. Setting up your hen house need not cost you a lot of money. I have been to my friend’s house this week to see her new rescued hens. 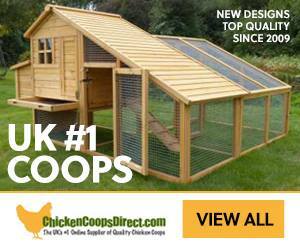 She has set up her coop using very little money by converting a shed. The shed was her biggest outlay and she shopped around for that to get the best price. Perches for the hens can be made from any long pole like structure. It just needs to be thick enough for the hen to curl her toes over. Many ex battery hens will need encouraging to perch as they will never have done this before. Although it is a natural behaviour some hens don’t do it. So don’t worry too much if your hens decide they like the floor better just keep it nicely bedded to keep there bellies dry. Basically anywhere that provides privacy and dim light. So taking this in to account, look around your home and sheds for items that could provide this type of environment. I have used old bedroom units and cupboards placed in a darkened corner of the chicken house. Fill the chosen nest box with bedding and away you go. You can make your own nest boxes from scraps of wood found around the garden etc. Put the word out to your friends that you are looking for spare wood and cupboards etc. It is amazing how much stuff is thrown out these days.